In the Golden Age of Palace Hotels, French was the traveler's lingua franca. Many French words of the trade have thus crept into other languages. So, I hope that English-speaking readers will view with indulgence my use of quite a few of them in this essay. I actually do not know the English equivalents to many of them. 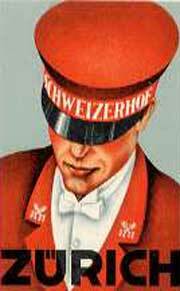 The concierge (hall porter) was, and still is, an instrumental figure in any major hotel. On entering the hotel, you would find him commandeering the desk in front of the receptionist's. Behind him are the keys to the rooms, from which derive the crossed keys on his lapels that symbolize his functions. The head porter, and he alone, is properly called ‘concierge’ and he proudly bears les clés d’or (the golden keys) on his lapels. Some of his personnel (a staff that might number over 50) including the second concierge and the concierge de nuit (night porter) also bear embroidered keys, but not golden ones. The concierge's written and unwritten duties are too many to list, but they have been described as a combination of public relations, aide-de-camp, travel agent, social secretary, best friend and miracle worker. In a grand hotel during the Golden Age, the concierge was not only unpaid but he often had to pay handsomely to the owners of the hotel for the privilege of his post. Even so, a popular concierge was so generously tipped that he was said to be the best paid of all hotel personnel, manager included! 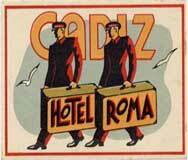 All better hotels had personnel whose job was to carry the guests’ luggage to and from the rooms, without ever crossing the entrance hall. These were called bagagistes (baggage porters) and it was their job to glue the hotel labels on to the luggage of guests, just before departure. 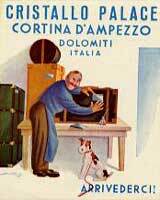 The Italian label at left, signed by Nino Za and dated 1931 shows a baggage porter at work gluing labels on to a suitcase. This label exists in three different versions, attesting that it must have been popular enough with the hotel to be ordered again and again. When there were no bagagistes, their function was performed by grooms. Grooms (often called bellboys in the US) were the message carriers and general do-all in the hotel, while the chasseurs were their counterparts for outside errands. The grooms sport a characteristic vest, often red with two lines of buttons, and a round hat which the French call camembert, from the name of one of their best known cheeses of about the same shape and size. Probably the most beloved of all groom labels is the attractive design at right for the Hotel Victoria in Cannes, printed in the early 1920s by Imbert & Cie of Grasse. A few years later the design was changed to incorporate the name of the owner of the hotel, P.Walsdorff, in which form the label was printed several times with slight color variations. The matchless Italian deco label at left dates from around 1930. The man preparing to enter the car is a voiturier, whose main job was to manage the parking of vehicles. The voiturier can be told apart from other personnel by the leather belt (not visible in this image). Like the grooms, chasseurs, bagagistes, liftiers (lift operators) and huissiers (who stay in or near the hall to open doors before guests, and always carry a nickel plated chain as a collar symbolizing their functions), the voiturier was part of the concierge's staff. 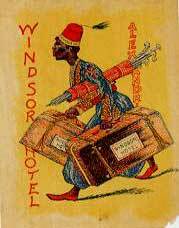 The voiturier is rarely represented in labels, whence the particular interest of this design which is further enhanced by the depiction of a groom carrying labeled luggage on to the hotel. 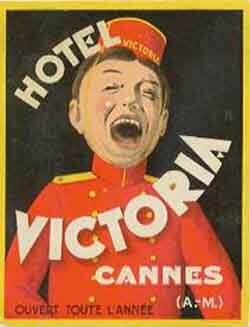 Once lodged, a would-be collector could depend on a porter or groom to obtain labels of the hotel where he was staying. Furthermore, personnel was always eager to satisfy a generous patron and the prospect of a good tip would certainly put a couple chasseurs to work with their counterparts of nearby hotels to obtain labels from several of them. 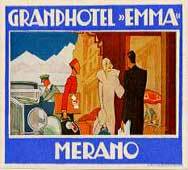 The reason why some labels are common today, is that, at the time they were current, someone gave a tip to a groom who supplied him with a few dozen labels from the stock of the hotel. Often, all the existing labels of a particular early type come from one single batch obtained by a forgotten collector of a century ago. Or, maybe, not entirely forgotten, because we are grateful to him! AN ANNOUNCEMENT: I do not use to mention myself or my habits in these pages but I will tell you now that one of my hobbies is staying in the older hotels (and if they are preserved in their old glory, all the better) and I intend to build an entirely new set of pages on this subject soon. I have often traveled just to stay in a particular hotel and, in fact, have just returned from Seville where I went to spend three days at the Hotel Alfonso XIII, one of the very few where most of the interiors were preserved as they originally were and still retains five-star status. I have long noticed that some people have "5-star fright", being afraid of looking like hillbillies in town if they lodge in a genuine luxury hotel. I once had the same fear myself, but I soon found that true 5-starrers were managed to make guests feel comfortable as long as they behaved in a civilized manner. Yet, some boo-boos can be quite embarrassing and spoil one's fun. Also, tipping may be a cause of stress to some... so I decided to put to writing what small experience I have of such matters. A guide to do's and don'ts in European palace hotels will thus be available shortly in my pages. Watch for it!